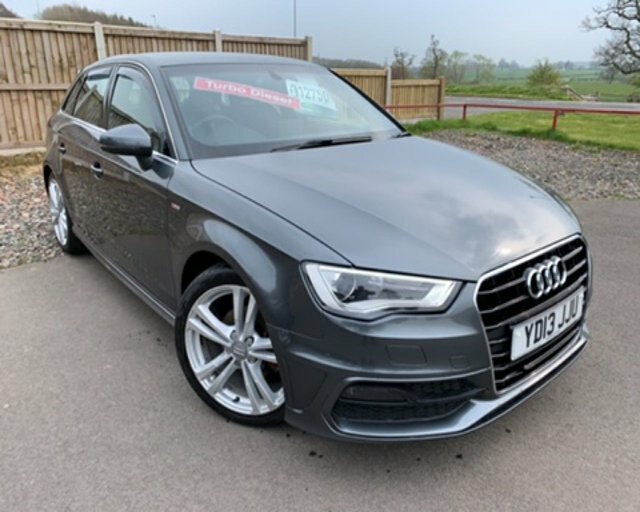 2013 13 AUDI A3 2.0 TDI S LINE 5 DOOR 148 BHP FINISHED IN DAYTONA GREY WHICH IS COMPLEMENTED WITH BLACK CLOTH LEATHER TRIMMED S-LINE SPORTS INTERIOR WITH THE S-LINE LOGO EMBOSSED ON THE THE FRONT SEATS. THIS IS A STUNNING EXAMPLE OF THIS EVERY POPULAR EYE CATCHING MODEL. THIS CAR WAS SOLD BY INTERCARS TO ITS PREVIOUS OWNER WHO HAS MAINTAINED IT TO THE HIGHEST STANDARD THROUGHOUT.THE S-LINE MODEL COMES WITH ITS VERY OWN BODY KIT WHICH MAKES THE CAR STAND OUT FROM THE REST AND FEATURES SUCH AS DIAMOND CUT ALLOY WHEELS, DAY TIME RUNNING LIGHTS, FRONT FOG LIGHTS, PARKING SENSORS,CRUISE CONTROL, TWIN CHROME TAIL PIPES,FLAT BOTTOMED LEATHER CLAD MULTI FUNCTION STEERING WHEEL, FRONT AND REAR ELECTRIC WINDOWS, DUAL CLIMATE CONTROL, AND A 6 SPEED GEARBOX. Come and discover the Audi A3 today at Intercars Of Carlisle Ltd. Offering four body types across the range, including the saloon, sportback and cabriolet, it's the most versatile model in the manufacturer's lineup. Lauded for its plush interior, sporty looks, impressive handling and punchy, efficient engines, the A3 leaves its competitors in its wake. View the complete range of used Audi A3 models for sale in Carlisle right here on our website. Alternatively, pay a visit to our showroom in person and let a member of the Intercars Of Carlisle Ltd team walk you though our stock of quality used vehicles. Feel free to get in contact online, by phone or in person to discuss your requirements.